Vertical Motorized blinds are one of the most stylish and affordable ways to cover off on a window covering solution. Vertical blinds are an ideal window covering in any office, workroom or public building from the point of view by the decoration and the function. Motorized vertical blinds also known as automated blinds, Remote Controlled blinds, Electric blinds, or Automatic Blinds, refer to the types of window blinds that are controlled with a remote control system rather than directly opened or closed by hand or with cords. Windows can have a dramatic impact on the decoration of any place. It is therefore not surprising that there is a wide range of vertical blinds available for offices. Windows in your office are a great way to get natural light, especially if you can easily open or close them easily with Motorized vertical blinds. But when you want to improve your privacy or protection from the sun, to close all your windows, you may need a lot of time, especially if you have many windows and they are hard to reach. No matter how many windows your office has. Vertical blinds are a great choice when it comes to convenience. However, if your office has a lot of windows or present, particularly large windows that are difficult to access, opening and closing the blinds manually can be a very annoying task. Motorized vertical blinds centrally managed from a single system, so you can open and close them quickly and easily at the touch of a button. If your office has a presentation room or media room, where you want to create complete darkness, you can achieve that particular environment in just a minute, with motorized vertical blinds that work easily, quickly and safely. - One button operation for rotating and traversing. 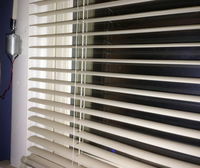 - All blinds tilt at 90 degrees when it opens or closes. - Opening Direction: One way or central opening. - One touch for controlling the individual or groups of blinds. Motorized vertical blinds eliminate the need to pull the strings that make blinds safe for children and pets. For over 20 years, the blinds have been considered unsafe because of the wires, which can be the subject of strangulation. These blinds make it possible to keep all cords out of the reach of children and enhance their attractiveness. They also provide a degree of safety and comfort for elderly people and people with disabilities, so they can easily adjust the heavy, hard blinds with a single click of a button. Vertical blinds windows provide spectacular high-grade technology. Not only they are attractive and easy to manage, but also these blinds can help you to reduce energy costs. Many of these blinds are made from materials that improve the isolation, thereby reducing the need for heating or cooling the office. Even just blocking the rays of the sun, blinds can reduce your costs of cooling the air with air conditioners in the office. Finally, perhaps the main advantage of Motorized vertical blinds is their classic style. These blinds are available in a wide range of colors, patterns and styles, so they can easily enhance the look of your office. Furthermore, motorized blinds provide an accurate and smooth movement in such a way that they can be arranged in a perfect alignment even for a clean look.